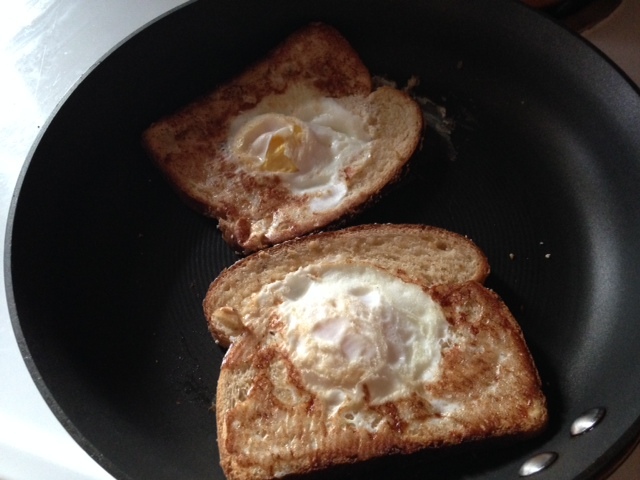 Some folks call this “toad in a hole.” Others, like my GeeGee, call it a “bird’s nest.” Either way, I think it’s a funny name for “egg in toast.” Mama keeps my yolk a little runny, so it perfectly soaks into the surrounding toast. Complete with a smoothie and some sausage, this was a terrific way to start the day. Even better, Mama served it to me in bed. But just so you know, if you give a kid breakfast in bed, he’s going to ask for it the next day. And the day after that. 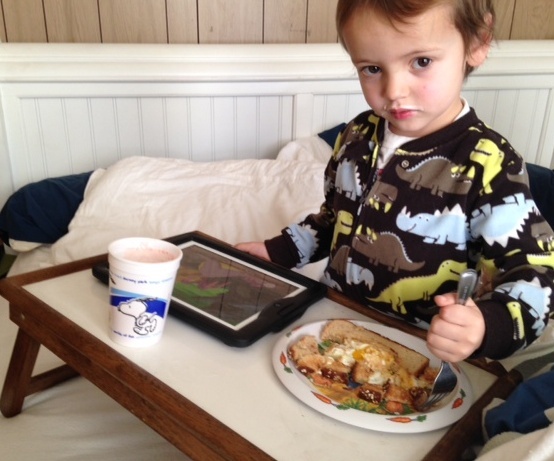 I was able to keep watching a show on the iPad AND eat my breakfast. Win-win. Tear out a piece of bread from the center of the slice. (The larger the hole, the more the egg will spread.) Butter the bread, on both sides if desired. Heat a skillet over medium heat. (Mama used a nonstick, just because.) 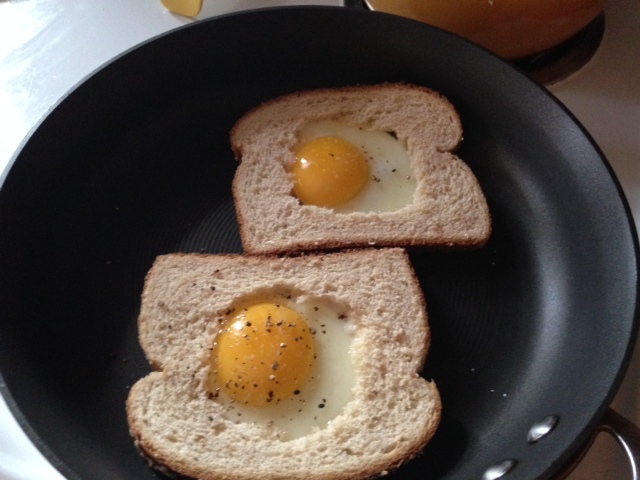 When hot, lay the bread in the skillet, butter-side down, and then crack an egg into the center hole. Sprinkle with salt and pepper, or other seasonings, if desired. The eggs fit nicely in their little bread nests. Cook until egg is of desired doneness—break the yolk if you like yours over hard, or “stepped on,” as Mama calls it. Carefully turn over and finish cooking on the other side. Enjoy! The buttery bread gets good and toasty. Categories: Breakfast, Hits, With recipe | Tags: baby food, Bird's Nest, bread, cooking, cooking with toddlers, egg and toast, eggs, recipe, Toad in a Hole | Permalink. Hi. I’m Jude. And I’m a pre-schooler. I have cousins who are picky eaters, so my mama was determined that I would be a good eater. This blog documents her efforts. Along the way, she schools me in cooking methods and techniques, while exposing me to new foods. And I always give her my honest opinion.